If my Instagram feed is any indication, farmers' market season is in full swing all across North America, with mouthwatering produce and abundant blooms enticing shoppers to bring home the best that local growers harvest each week. Having a presence at one or more farmers' markets in their region offers many specialty cut-flower farms a regular source of cash flow, valuable face-time with loyal customers, and a platform for promoting other channels of business. Admittedly, there is a cost to selling flowers and bouquets at your hometown farmers' market, a cost measured in time spent away from the farm or paying an employee to staff the market stall. Yet savvy growers, ones who have developed multiple outlets for their flowers, continue to sell through farmers' markets. There is income to be made at the market, but profitable margins rely on building efficiencies into the bouquet-making operation, and branding that emphasizes "couture" over the "commodity" (aka price-sensitive) nature of farming. Your flowers are an affordable luxury. There's a lot of inherent value in a market bouquet, according to a cross-section of Slow Flowers members I've interviewed. Let me introduce you to a few of them, and the practices they use to ensure their bouquets are desirable, affordable, and profitable. Images used with permission. All rights reserved. In Greek mythology, Zephyros is the god of the west wind, god of spring, husband of Khloris [greenery], and father of Karpos [carpus, fruit]). In 2016 I visited Zephyros Farm & Garden in Paonia, Colorado, where Daphne Yannakakis and Don Lareau operate a thriving, floral-centric business. Zephyros is a small, diversified family farm that lies on 35 acres on the Western Slope of Colorado in the North Fork Valley, specializing in Certified Organic flowers and vegetables for seasonal farmers' markets in Aspen (Aspen Saturday Market) and Telluride (Telluride Farmers' Market), as well as for restaurants, florists and flower CSA customers. Not only growers of food and flowers, Daphne and Don are passionate floral designers who offer wedding and event flowers and use their farm as an occasional venue for couples to get married. My visit gave me a behind-the-scenes peek at how much work goes into farmers' market preparation. Don and Daphne invited me to join in the bouquet-making process with them and their seasonal team of designers and interns. It was hard work, particularly difficult because of the abundance of choice from which to design — annual flowers, herbs, ornamental grasses, and foliages galore filled nearly 50 buckets of individual varieties. New hands are often paired up with the more experienced ones in the "Flower Den." Don explains that much of the success of the farm's bouquet program begins in the field, "where we insist on a good job of stem stripping, which keeps our buckets cleaner and leaves the stems ready for sale or bouquets." 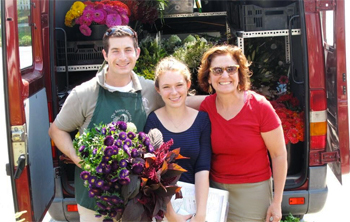 Zephyros Farm & Garden's bouquets don't rely on a specific recipe or production-line method. "If someone is new to the 'flower den,' as we call it, they need to be able to move fast and design a bouquet up to our standards. New people are often paired with a more experienced bouquet-maker and asked to mimic them," Don says. "We know that our farmers' market clients are looking for something special. In part, (that demand) is something we created by bringing higher-end designs to market. For example, our 'Flower Power' is a basic bouquet packed with flowers, which retails for $20. Although this is a simple table bouquet, we try to include as many seasonally available elements as we can, and also go for unique color combinations. "We know that our farmers' market clients are looking for something special," Don says. "Our large bouquet, which we call 'Bodacious Blooms,' is designed using freshly-harvested flowers, foliages, and grasses like bupleurum, bells of Ireland, lonicera, perennial sweet peas, lilac, Nanking cherry, peony leaves, amaranth, Physocarpus 'Diablo,' and Cotinus. We also showcase more expensive flowers that change seasonally, such as peonies, Oriental, Oriental–Trumpet, and Asiatic lilies, dahlias, lisianthus, and tuberose. We also grow secondary flowers such as delphinium, yarrow, Icelandic poppies, Scabiosa caucasica, helenium, eryngium, echinops, phlox, and veronica, and annual workhorse snapdragons, zinnias, dianthus, godetia, calendula, celosia, and asters. This bouquet sells for $40." Don says the key to Zephyros Farm's bouquet strategy is to offer different color schemes and styles at both price points. "This keeps it interesting for us as designers. It also means we hire people who have their own aesthetic. We're always amazed that a bouquet one of us might find unappealing seems to find a market customer who loves it. As we have gotten to know our regular customers, we also know which color combinations sell best." 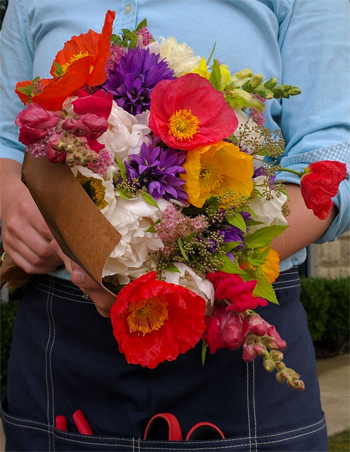 In addition, Zephyros Farm & Garden brings lower-priced flowers to market, such as $10 mini-bouquets and $5 bunches of sweet peas, scabiosa, or poppy seed heads, which some customers purchase as an add-on to the larger mixed bouquets. Despite all the care that the Zephyros team puts into market bouquets, inevitably, there are some arrangements that are passed over. When this happens, Don encourages his crew to take out elements that don't look quite right, or tweak the design with a few new stems. It becomes farmers' market "theatre" because shoppers engage with the design process. "Generally, someone will buy that bouquet right out of my hand, as it looks freshly-made even if it has been on the rack all morning." While the stall has plenty of pre-made bouquets, the team brings extra stems, both to sell individually and use in custom arrangements. "This keeps our people busy and draws intrigue in the stand, attracting customers," he says. "Often if you sell a bouquet out of your hand, someone who was watching you make it will ask for the exact same thing. Sometimes, we've sold four or five bouquets in a row like that." Bluegreen Gardens owners Mike Zawislak and Elizabeth Fox Zawislak met while working at famed Longwood Gardens. At Bluegreen Gardens, farmers Mike Zawislak and Elizabeth Fox Zawislak operate a boutique flower farm and floral design studio. The couple met while working in public horticulture at famed Longwood Gardens in Pennsylvania and eventually moved to Lancaster, Ohio (outside Columbus), where they now grow flowers for CSA customers, a community market, local florists, and DIY weddings couples. 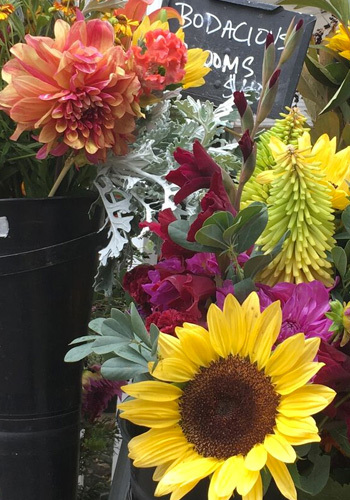 Since 2016, Bluegreen Gardens has sold flowers at the Bexley Farmers' Market, the Lancaster Farmers' Market, and the Pearl Market in downtown Columbus. According to Elizabeth, each farmers' market has its own personality, which influences the bouquet-making process. "We tailor bouquets to individual markets," she says. "For example, we have one market (Tuesdays, 10:30am–1:30pm) located near downtown offices, so we typically bring Mason jar bouquets for customers to bring back to their office to enjoy there for the week. Our Mason jar bouquets were $8 last year, but we're bumping them to $10 this year. At one of the higher-end markets, we bring three different-size bouquets and typically fill the larger, more expensive ones with higher-price point flowers, adding to the value." Bouquets are tailored to match the personality of each of the markets where they are sold. Elizabeth and Mike have found that customers appreciate the unique and harder-to-grow varieties, "and this allows us a good return on the size of the bouquet." 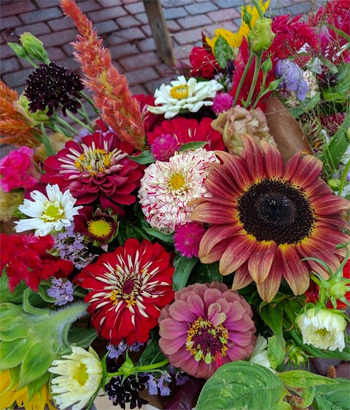 Made-to-order bouquets are an option at the markets, but because Bluegreen Gardens only sends one person to staff their stall, they prefer to emphasize the pre-made bouquets, single-variety growers' bunches, and single stems. "We are actually selling more (pre-made bouquets) than when we custom-made bouquets," Elizabeth says. Flowers are typically bunched, sorted, and cleaned in the field, then stored overnight in a cooler. "This allows us to concentrate solely on making bouquets the day before we go to market, then grab and go the following morning," she adds. Rather than using a flower recipe, Bluegreen Gardens' bouquets are designed around a color palette. "We try to make about five or six bouquets in one color before switching. We don't have a stem-count per size; rather, we make the bouquet to fill out the pre-made sleeve. Short stems are saved for small Mason jar bouquets so they don't go to waste." Designing the bouquets around a color palette, "We try to make about five or six bouquets in one color before switching," says Elizabeth. Flowers are packaged in two different Aroo Kraft paper sleeves (14-inch and 16-inch), branded with the Bluegreen Gardens logo via a self-inking stamp. Elizabeth says the stamp is more cost-effective than previously used stickers. Like many boutique flower farms, Bluegreen Gardens continues to evaluate pricing. "We started out with $10 small bouquets and have now increased those to $12. That $2 price increase has added to our profits, and customers do not seem to mind as they still perceive our bouquets as good value," Elizabeth explains. They often make larger bouquets for $20, especially when it's dahlia season. "Our prices are consistent throughout the market season and include sales tax. We just change the quantity of stems to match that price point, depending on the varieties used." Accepting credit cards at all three of the farmers' markets they serve has been a plus because not all customers bring cash to shop. "We use a tablet with a Square reader to complete all our sales, and this has saved us time because those transactions are imported into our accounting software. It also makes it easier to collect and manage our sales tax, because we sell in different tax jurisdictions," she adds. Having a bountiful, colorful, and exciting farmers' market stall is Bluegreen Gardens' best marketing strategy, the couple says. "We are lucky to not have to compete with other farmers who grow strictly flowers. Some produce vendors bring flowers to our markets, but what has set us apart from them is the quality of our blooms — not to mention the sheer quantity," Elizabeth says. "Showing a full market stand communicates to our customers that we are serious about flowers!" Robin Hollow Farm uses sustainable and organic methods to supply local CSA customers and seasonal farmers' markets in Newport, Saunderstown, and Providence. Farmer–florists Polly and Mike Hutchison run a thriving flower farm in Saunderstown, Rhode Island, just minutes from Newport and Providence. 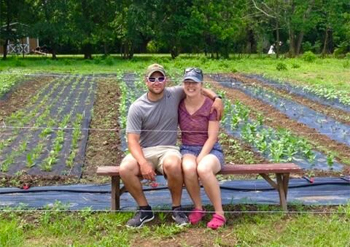 Veteran growers, they use sustainable and organic methods to supply local CSA customers and shoppers at three weekly seasonal farmers' markets in Newport, Saunderstown, and Providence. Robin Hollow Farm designs florals for an impressive number of weddings and events each year and also sells wholesale flowers to local florists. Polly says the farm's bouquet-making operation runs efficiently thanks to years of developing best practices. The season starts in April when bouquet sleeves are pre-labeled, ready to use long before any flowers are ready for harvest. "We have used Kraft paper sheets, but we're currently trialing pre-made paper sleeves as the supplier now offers more size options," she says. "Our bouquets come in a diverse range of colors — tone-on-tone, pastels, dark-light contrast, bright and vivid, blue and white, yellowy-oranges, and pink and green, for example," says Polly. 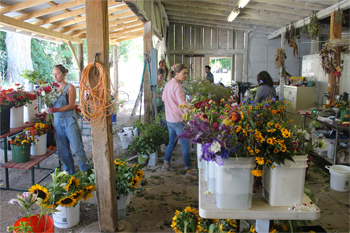 A regular crew of two or three people who have learned the Robin Hollow design aesthetic and "best practices" assemble the market bouquets. Polly credits having a dedicated studio with an efficient work flow layout for a successful operation. "We make sure that everything is gathered and ready to use — from the guillotine cutters and elastics to enough black bouquet buckets for the amount we need to make. We count out buckets, fill them with about 4 inches of water and allot four bouquets per bucket — that way we don't have to keep counting bouquets." Mixed bouquets are planned by colors or styles, with loose stems grouped accordingly by buckets. "Our bouquets come in a diverse range of colors — tone-on-tone, pastels, dark-light contrast, bright and vivid, blue and white, yellowy-oranges, and pink and green, for example." The farmers' market stalls are vivid and enticing displays that feature an abundance of flowers. Because Robin Hollow has a reputation for designing wedding florals as well, "we want our look to be high-end and unique," Polly explains. "We always include flowers with a perceived 'high value' such as lilies and lisianthus — and we've found that our open lilies are perfect for market bouquets. 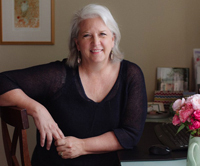 We design wild and flowery bouquets and also tonal-style bouquets," Polly explains. "Since we have clients who like both styles, it's nice to offer them a choice." In addition to the lilies and lisianthus, focal flowers may include dahlias, sunflowers, hydrangea, and peonies, depending on the season. Secondary flowers include snapdragons, dianthus, amaranth, monarda, echinops, foxglove, aster, and crested celosia. Textural fillers include feverfew, gomphrena, gypsophila, ageratum, astrantia, astilbe, larkspur, and feathered celosia. Greenery includes thornless blackberry, marigold greens, rose geranium, mountain mint, basil, alternathera, and dusty miller. 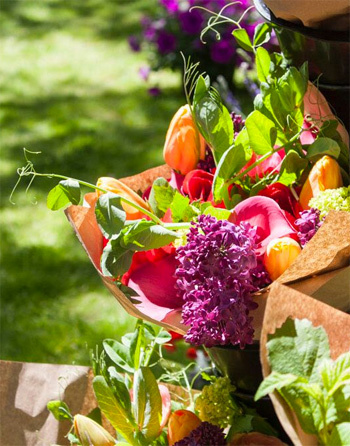 The farmers' market stalls are vivid and enticing displays that feature this abundance of flowers. Use 1 type of focal flower, 1–2 types of secondary flowers, and 1–2 fillers or foliage/greenery options. Bouquets should be symmetrical, with flowers evenly distributed. "It can be easier to start with a 'frame' of focal flowers that are bulky, like lilies and sunflowers, then fill in around them with secondary elements," Polly says. Bouquets should look good "from the top" because that's how they are displayed, and all focal flowers should be visible. Most of Robin Hollow's market bouquets are sold at the $20 price point with tax included. "At our busiest market, there are always other vendors offering low-cost bouquets," Polly says. "But we've found the $20 bouquet serves as a 'cash express lane' — folks just hand us a $20 bill and scoot off to their other errands without standing in the line." It has proven to be the "sweet spot" — for farmers and customers alike. Having plenty of fillers and foliage on hand throughout the season will help you keep your bouquets looking full and fresh. Productive and sturdy, sunflowers and zinnias are the workhorses of market bouquets. Sunflowers: Consider color in your sunflower succession-planting plan. Pastel and bright colors are popular for spring and summer bouquets; reds, chocolates, and dark orange for fall. Zinnias: The unique and versatile colors of the Queen Series are a hit for bouquets that are brightly colored or made up of a more sophisticated color scheme.